On Saturday, January 19, 2019 members of the St. Luke Serbian Orthodox Church of Washington, DC/Potomac, MD gathered to celebrate the great feast day of Theophany – the baptism of our Lord in the River Jordan by St. John the Baptist. The festive day begin with a celebration of the Divine Liturgy. Even though it was a dreary Saturday morning, many parishioners braved the elements to attend this special Divine Liturgy. As is customary on Theophany, the great blessing of water was also performed. We also welcomed a new parishioner into our parish this day. Hanna-Leena Miletic, who was baptized into the Orthodox faith in 2018, was in attendance. She moved to the Washington area from Finland just two days prior to join her family. After the Liturgy, Fr. Vasilije and some members of the parish made the over 50-mile journey to the shores of the Chesapeake Bay. For the first time in the Washington parish in many years, the blessing of a body of water and the “race for the cross” was performed. The Chesapeake Bay is a significant body of water and is the largest estuary in the United States. Further more, over 17 million people live in the Chesapeake Bay Watershed and have their daily lives impacted by the Bay. Many others vacation on the Bay each summer. After Fr. 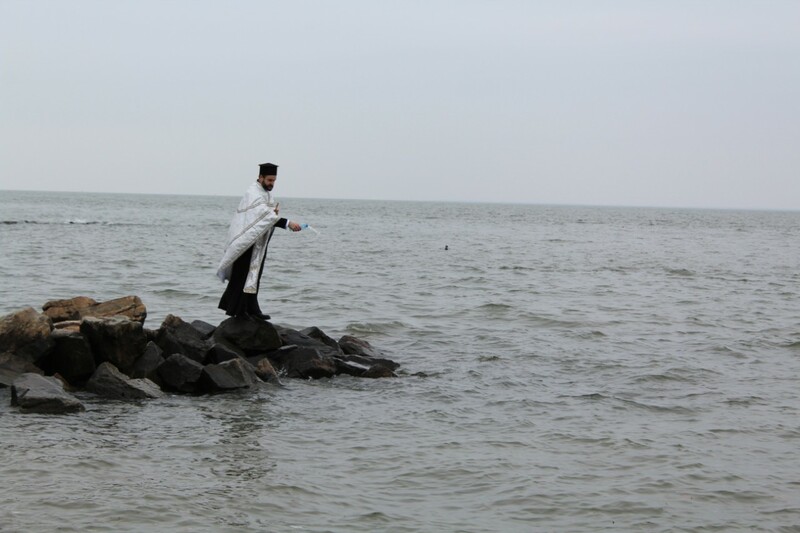 Vasilije performed the blessing of the waters on the Chesapeake, four brave young parishioners – Dragisa Djordjevic, Branislav Barjaktarov, Uros Ilic, and David Stajic - entered the water. The air temperature during this time was roughly 37 degrees with clouds and wind; the water temperature about 46 degrees. This was not a pleasurable experience, however these young men braved the conditions because of their love of this custom and of the great feast of Theophany. After Fr. Vasilije tossed a wooden cross into the Bay, David Stajic was the lucky one to retrieve it. We pray that he will receive good fortune in the New Year. In all, it was a very special day in our Washington parish filled with many blessings. We pray that God will continue to look down upon us and bestow His blessing upon our diocese and us!